In today’s world of dietary landmines it can be difficult to know what is okay to eat. You have probably heard by now that sugar is bad. It can increase the risk of poor health and should only be consumed in moderation. However, there are many other sweetener choices available. 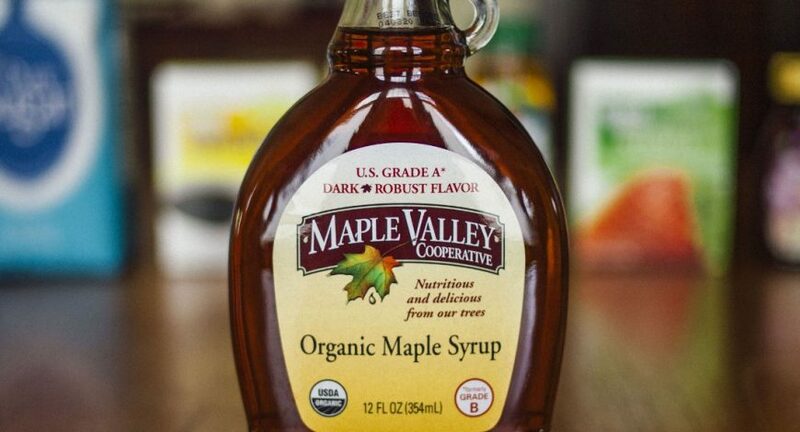 Maple syrup is often considered one of the healthier sweeteners on the market. As we already discussed in Organic Maple Syrup’s Nutritional Value, maple syrup provides benefits that can not be found in cane sugar. It contains 54 compounds including a variety of beneficial antioxidants, vitamins, & minerals. There are a variety of medical studies showing that it may aid in fighting Cancer, Diabetes, & Alzheimer’s Disease. It has also been shown to boost antibiotic efficacy and aid in liver health. What about the other sweeteners that are available for use? How do they compare to maple syrup’s benefits? The answers may surprise you. The baseline for our comparison is sugar. It is expected that all options will be better for us than sugar, but just what does that mean? In 100 grams of sugar (or half of a cup) there are 387 calories and 100 carbs. It also has very little to offer as compensation for its high calories and carbs. The only notable vitamin it contains is Riboflavin (or B2). There is only 1% of your daily requirement of Riboflavin in a 100 gram serving of sugar. Now that we have an understanding of how unhealthy sugar is, we can examine the “healthier” options. The most logical next step is to consider other types of sugar. 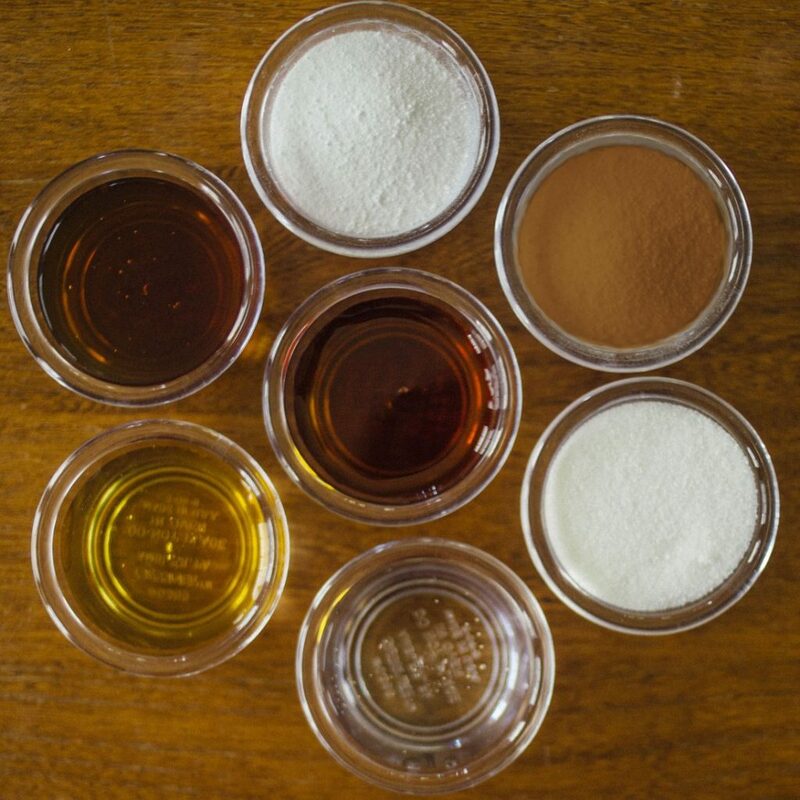 Generally, granulated sugars are less healthy than syrups as they are more concentrated. Brown sugar and Maple sugar, popular second choice options, have slight benefits over refined white sugar. Brown Sugar is the same product as white sugar, but less refined. In a 100 gram serving, there are 380 calories and 98.1 carbs. Because it is less refined, it does retain some of the minerals that have been taken out of white sugar. In the same size serving, there is a daily value of 8% calcium, 4% iron & potassium, 3% Manganese, & 2% Magnesium. It does not contain any vitamins. In comparison, Maple Sugar has much more to offer. In 100 grams, maple sugar contains 354 calories and 91 carbs. That is 33 less calories than sugar and 26 less than brown sugar. Its mineral content is impressive, with daily percentages that shame other sweeteners; syrups and granulated alike. It contains 221% of your daily Manganese, 40% of your Zinc, 9% of your Calcium & Iron, 8% of your Potassium, & 5% of your Magnesium. In addition to these, it also has 1% of your daily B1 & B2 vitamins. In general, syrupy sweeteners are the most healthy option. Popular choices include light corn syrup, agave nectar, honey, and maple syrup. Although a popular alternative to sugar, agave nectar comes in last of all sweeteners when it comes to vitamins and minerals. In 100 grams of nectar, there are no beneficial vitamins or minerals. When it comes to calories & carbs it is the highest of the syrups. In the same serving size, it contains 286 calories & 76.2 carbs. Light corn syrup is very similar to agave nectar in value. It has 282 calories and 77 carbs in 100 grams. It does contain some trace minerals: 3% of your daily zinc and 1% of your daily calcium. Also, it contains 4% of your daily B1 vitamin, giving a slight leg up over agave. Honey is a very popular alternative sweetener and very attractive to those who are interested in natural and unaltered foods. Unfortunately, of all of they syrups, it contains the most calories (304 in 100 grams) and carbs (82.4 in 100 grams). Luckily, Honey does contain more vitamins & minerals than agave & corn syrup. In 100 grams, daily percentages are 3% iron & B3, 2% zinc, & 1% calcium, magnesium & potassium. When compared with the syrups listed above, it becomes clear that maple syrup is the best choice. It has the lowest number of calories; only 260, and carbs; only 67 in 100 grams. 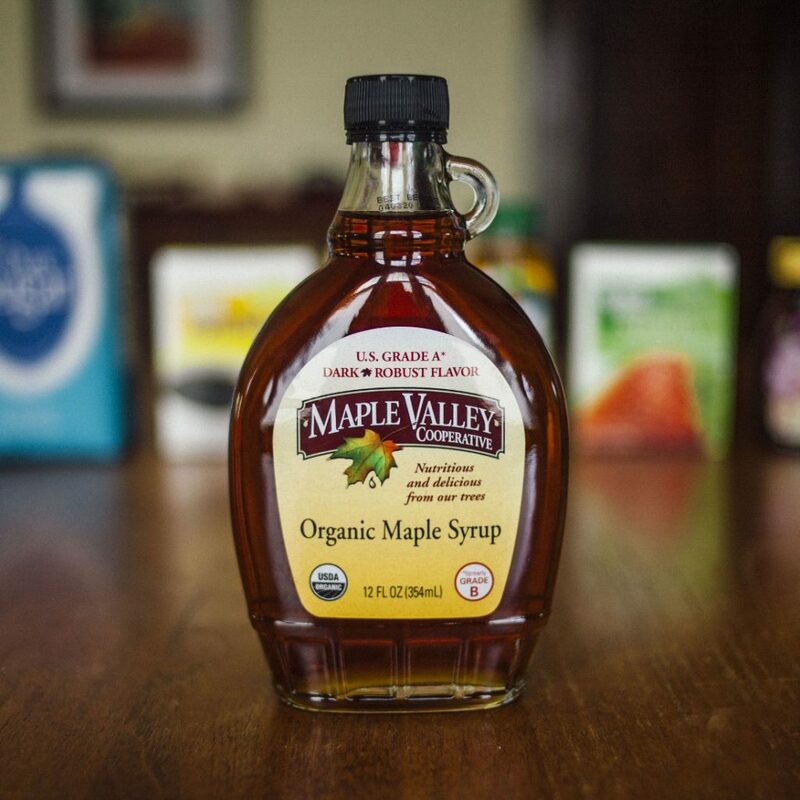 When it comes to vitamins & minerals, maple syrup is beat only by its more concentrated form: maple sugar. In 100 grams (about 1/3 cup) of syrup, there is 138% daily manganese, 15% zinc, 10% calcium, 6% magnesium, 5% potassium, and 1% iron. In addition to these, it also contains 6% B1 and a whopping 106% B2. It also contains the same allure as honey in that it is an all natural product that has endured very minimal processing. It is important to note that all types of sugar should be consumed in moderation. However, if you are going to use sweeteners in your daily recipes, informed decisions are important. When looking at the facts, it is not hard to see why so many are choosing to use maple syrup in place of other sugars. It is not difficult to substitute maple syrup or sugar in a recipe. For every cup of sugar or brown sugar, you should use 1/2 a cup of maple sugar or 2/3 cup of maple syrup. 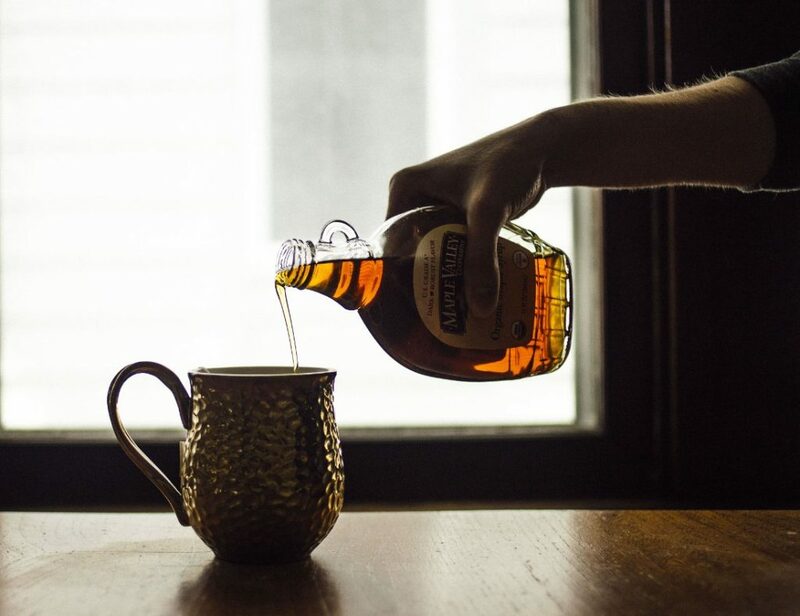 Honey, agave, & corn syrup can be replaced with maple syrup at equal quantities. If you are replacing sugar with maple syrup in a baking recipe, you should also remove 3 additional tablespoons of liquid from the recipe. Reduce oven temperature by 25 degrees to prevent over browning. Enjoy! It should be stressed that the nutritional values are from 100g. In the Maple Syrup sentence that starts with “It contains 221% of your daily Manganese”, the use of “your” makes it personal and the value of 221% is supposed to give an impression of one’s daily manganese needs being amply satisfied. This is misleading as 100g is not an amount that you’d be wanting to eat on a daily basis. The article would have a more honest tone if the comparison were done in terms of a reasonable daily consumption of syrup as a sweetener or some other unit. You might, for instance, do it in terms of teaspoons. Hello John, thanks for your comment. The 100 g measurement was used because it is a common amount used in nutritional value reports. 100 grams of maple syrup is only about 1/3 of a cup. Though a person might not consume 1/3 of a cup of maple syrup daily, it is not an unreasonable amount to use in a recipe or on pancakes. However, we do appreciate your feedback and will take a look at the article to see if we can make it more clear. Thanks again!